Washington DC, as the nation's capital, has a variety of impressive churches that are historically, culturally, and architecturally significant. Here is just a sampling of several impressive structures from a variety of religious denominations. Historic St. John's Church is located at Lafayette Square across from the White House in Washington DC. This protestant Episcopal church is open to all for worship, fellowship, and outreach activities. The Washington DC Mormon Temple, officially named the Church of Jesus Christ of Latter-Day Saints, is located about 10 miles north of the Capitol in Kensington, Maryland. The beautiful golden spires can be seen from a distance along the Capital Beltway. The Washington DC Temple Visitors' Center hosts numerous interactive exhibits, lectures, and concerts throughout the year. At Christmastime, the Mormon Temple is brightly lit and offers nightly concerts, a live nativity scene, and international nativity sets. The Basilica of the National Shrine of the Immaculate Conception is the largest Roman Catholic church in the United States and is one of the largest churches in the world. The National Shrine is designated by the United States Conference of Catholic Bishops as a National Sanctuary of Prayer and Pilgrimage. It boasts the largest collection of contemporary ecclesiastical art in the world. The National Shrine is open 365 days a year and features daily guided tours, a Catholic Gift Shop, a Catholic Book Store, and a cafeteria. The Cathedral of St. Matthew the Apostle in Washington DC honors the patron saint of civil servants and is the seat of the Archbishop of Washington. Established in 1840, the parish church originally was located at 15th and H Streets, NW. The current building has been in use since 1895. 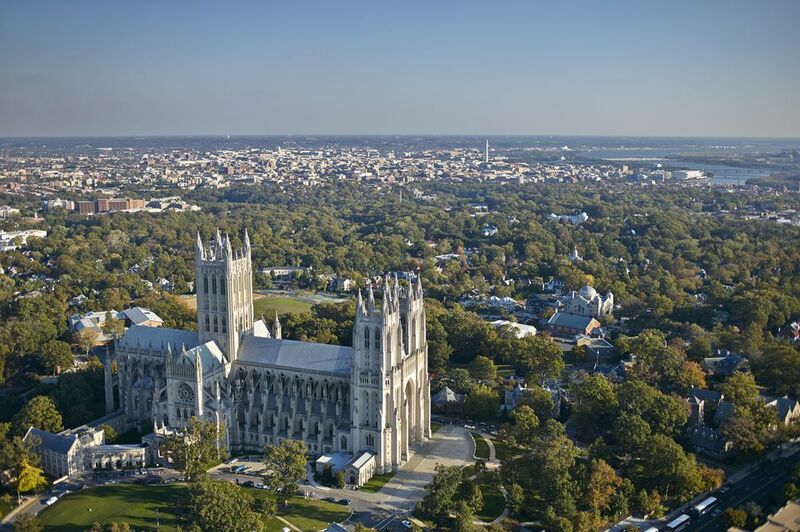 The Cathedral has been cited as one of the most beautiful and impressive houses of worship in the United States. Georgetown Presbyterian Church was established in 1780, and its ministry is the oldest church of any denomination in Washington DC. The current building has been in operation since 1871. The National Presbyterian Church, located in northwest Washington DC near American University, offers Sunday worship services, Christian educational programs, and opportunities to serve the community. Foundry United Methodist Church has been a spiritual leader in Washington DC for more than 186 years. 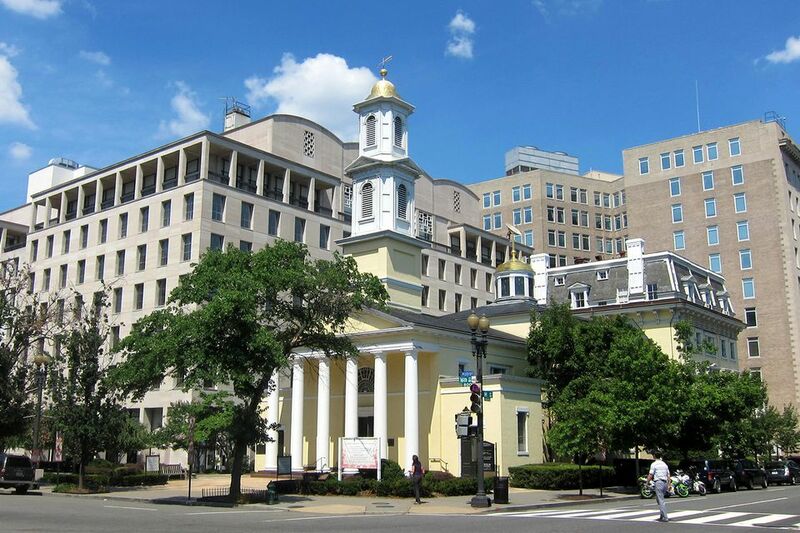 Originally located in Georgetown and later at 14th and G, the church has been home to presidents, members of Congress, and others in public service. In 1995, Foundry affirmed that it was a reconciling congregation, upholding the belief that we are being reconciled to God and to one another. The current location is in Washington’s Dupont Circle neighborhood. Grace Reformed Church's congregation is over 100 years old, and the property is a registered National Historic Landmark. President Teddy Roosevelt laid the corner stone of the building and also attended during his time in Washington DC. Luther Place Memorial Church was founded as Memorial Evangelical Lutheran Church in 1873 as a memorial to peace and reconciliation following the Civil War. Two of the original pews were dedicated to Generals Grant and Lee. Since the 1960s, the church has encouraged an interfaith community of religious groups to coordinate ministries for the poor. In the 1990s, the church advocated for gay lesbian, bisexual, and transgender rights and inclusion. The Metropolitan African Methodist Episcopal Church was founded in 1838 as an African American independent religious body. It is known as "The National Cathedral of African Methodism." The church spreads the gospel of Christ through various ministries and outreach programs in Washington DC. The Calvary Baptist Church is a Baptist church with a multi-racial congregation located in the heart of Washington DC. The historic facility dates back to 1862 and consists of three interconnected buildings that provide space for worship services (in English and Spanish), Sunday school programs, and a variety of community outreach programs. The facility is also available for outside groups’ programs and events. Church of the Holy City is a part of the Swedenborgian Church, a Christian denomination that draws its faith from the Bible as illuminated by the teachings of Emanuel Swedenborg (1688-1772). The congregation of the National City Church dates back to 1843. Various properties in Washington DC were used for worship until the current building was built in 1929. The church provides regular opportunities for worship, spiritual growth, and fellowship. It is an inclusive Christian community that embraces people of every race, gender, age, culture, economic circumstance, sexual/gender orientation, family configuration, physical, or mental condition. Second Baptist Church is the second-oldest African Baptist Church in Washington DC, dating back to before the slaves were freed in DC. The church was established in 1848 and held services in several locations until its current building was built in 1894. The church was a stop on the Underground Railroad in the 1850s during the pastorate of Reverend Sandy Alexander and, during its long, rich history, has attracted such notable speakers as Frederick Douglass and Reverend Adam Clayton Powell. The church is a designated historical site and enjoys the protection of the local and national registries. The current pastor is Reverend Dr. James E. Terrell, who served as Assistant Pastor from 1991 through 1997, and, in 1997, became the Senior Pastor. Don't Miss the DC Jazz Festival!